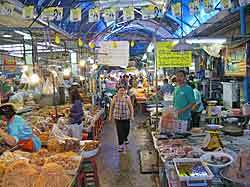 Chatchai Market in Hua Hin (also transliterated as Chat Chai), is well worth a visit. Whenever we head to the south of Thailand, on our own or during one of Kasma’s small-group tours to Thailand, we always plan to stop. 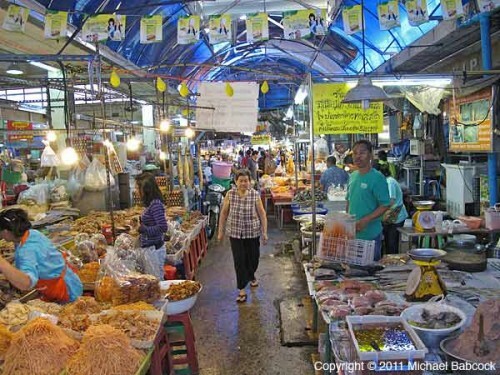 The market is located off the main highway, highway 4, also called Thanon Phetkasem (Phetkasem Street); it’s on the right as you head south. 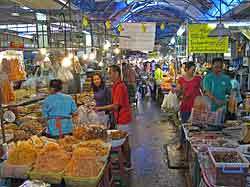 The southernmost boundary of the market is Thanon Dechanuchit (Dechanuchit Street). The market is mostly indoors, with a little spillage to the street. This is mainly a market for locals, featuring fresh ingredients of all kinds: vegetables, fruit, fresh-pressed coconut milk, meats, fowl and seafood. 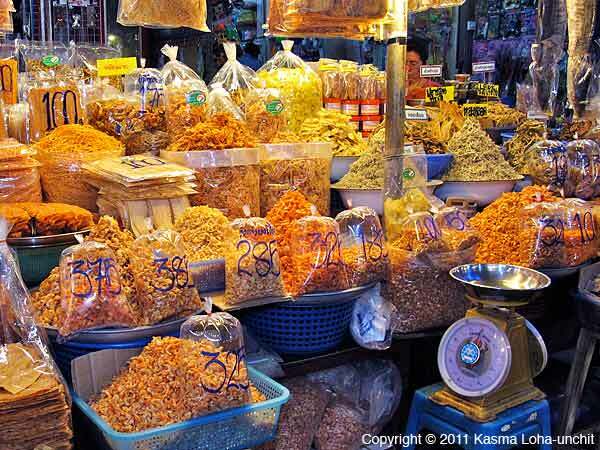 It also includes stalls with dried ingredients (dried shrimp, etc.) and prepared food. On the north end there are a number of shops catering more to the many fahrang (Caucasian) tourists and selling beach attire, colorful shirts, straw mats for the beach and so on. We go largely just to enjoy the lively, colorful display of fresh food. 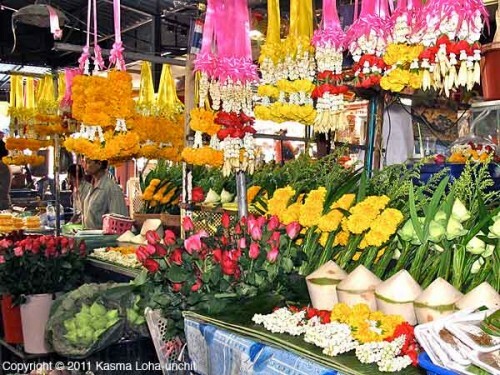 Different markets throughout Thailand have different feels. This market is one of the most bustling markets we go to: the aisles are a bit narrow and it seems as if there is always someone wanting to get past you in the cramped quarters. Often you’ll have to scrunch over to one side to allow a motorcycle (often making a delivery, the item in a box on the back of the motorcycle) to edge past you. So be prepared to be jostled and don’t block the aisle too badly when you take photographs! I always look forward to one of the aisles at the market where you find all kinds of dried foods; for years I’ve tried to reproduce the wonderful palette of oranges and reds created by the stacks of dried shrimps, vegetables and fruits. 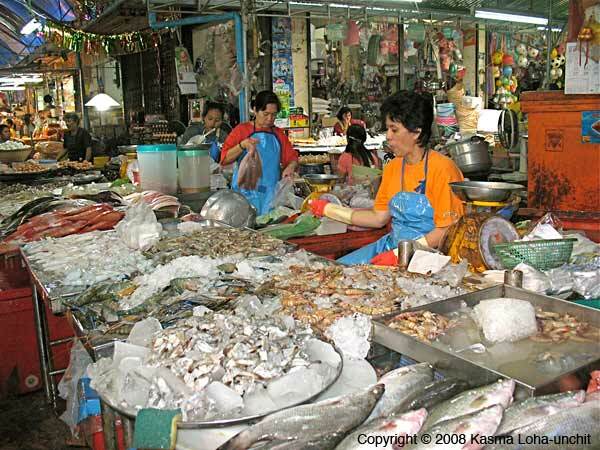 When I think of Hua Hin Market, one thing that I always think of is fresh seafood. Hua Hin is right on the coast and the market naturally contains a whole section with many seafood vendors. The aisles in this section can be a bit treacherous: they are often very damp and often a bit slimy from water used to clean and refresh the seafood. Tread carefully! Usually a vendor will specialize in one thing or another: fresh fish, shrimp, squid or crabs, for instance. In addition to the fresh seafood, you’ll find all kinds of dried fish, squid and shrimp. When you see all the fresh seafood, openly displayed, you wonder how on earth all of it can get sold and what happens to the surplus. Luckily, Thais love seafood so probably hardly any of it goes to waste. 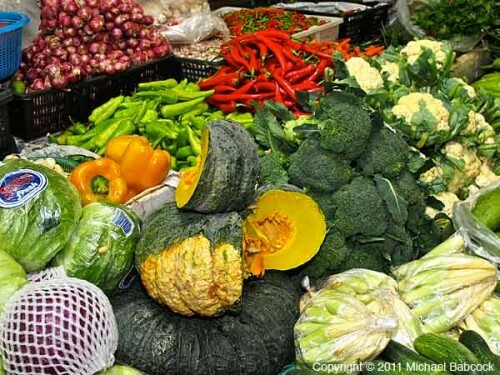 As befits a local market, there are a large number of vendors with fresh vegetables, ranging from large stalls with just about everything, to small vendors on a straw mat on the ground with just a few items to offer. As usual, you’ll find any vegetable you could desire for cooking Thai food, including items that we would love to be able to buy in the U.S., such as “rhizome” (krachai) and fresh, green peppercorns. 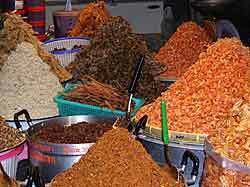 In addition, you’ll find varieties of vegetables that are very different from what you’ll find back home. 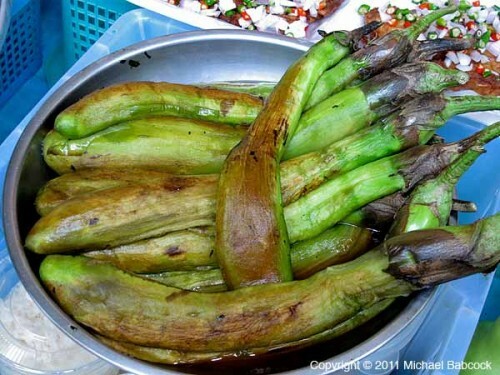 One example is the long, green eggplant (makeua yao) that is so delicious when roasted; you’ll even find it here already roasted – all you need to do is take it home and easily finish a delicious Roasted Eggplant Salad (Yum Makeua You). One of the aisles at Hua Hin Market; notice the motor scooter in back. 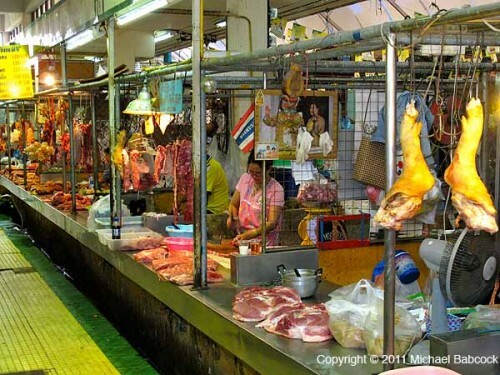 Here's a view of Hua Hin Market from the inside. 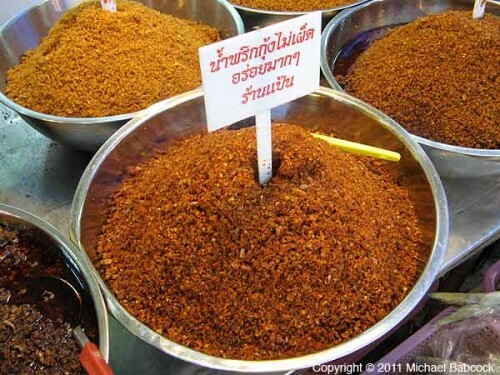 There are numerous stalls selling dried shrimp and the like. Here are several kinds of dried foods, including colorfully orange dried shrimp, to the right. 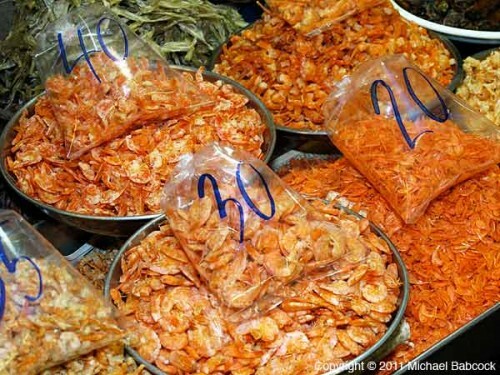 Here are 4 different dried shrimps, packaged to sell. 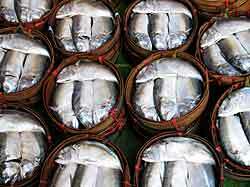 Hua Hin is on the coast and the market features numerous vendors of extremely fresh seafood. 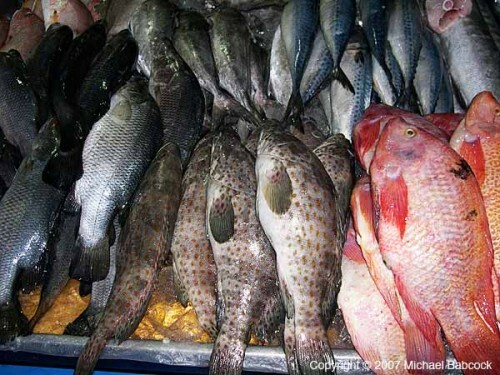 Here's one vendor's selection of whole, fresh fish. 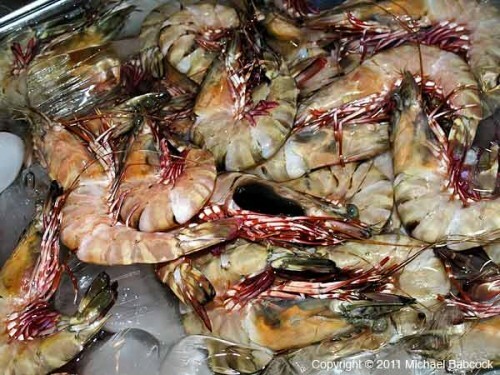 Fresh prawns (shrimp) such as these are widely available. 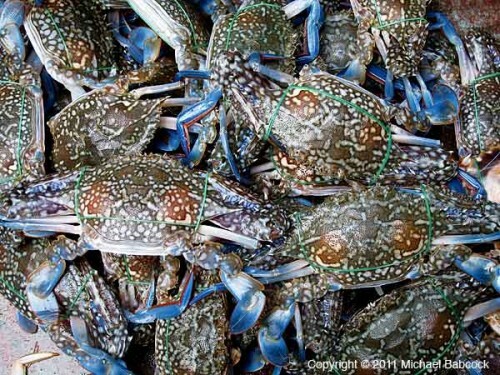 Other vendors offer fresh crabs, such as these. This dried mackerel (pla too) is one of Thailand's favorite fishes; here it's sold in baskets, ready for steaming or frying. 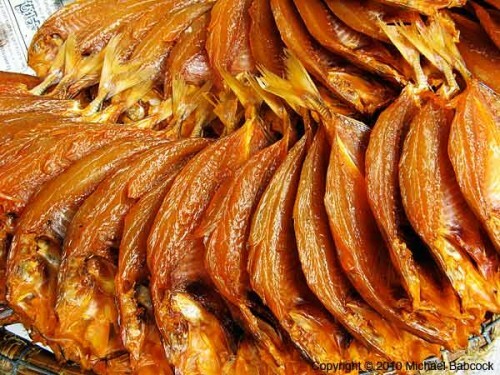 Other kinds of dried fish are artfully arranged in an aesthetic swirl. 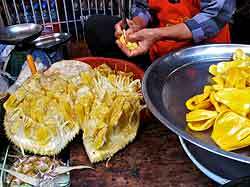 Hua Hin market always seems to have delicious jackfruit; here a vendor separates the fruit to sell. 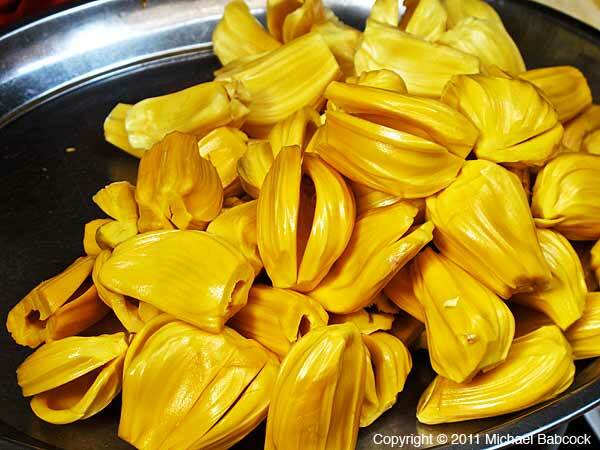 Here's the fruit of the jackfruit, removed from the sticky matrix and ready to eat. 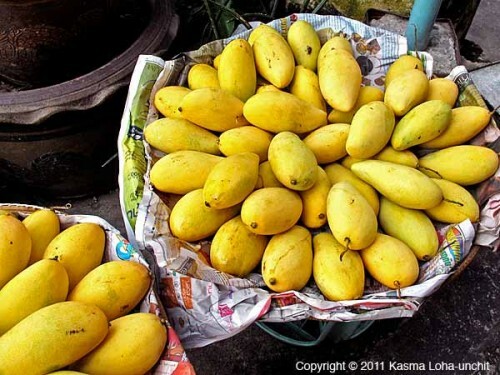 Of course, there's all kinds of other fruits as well, such as these sweet, yellow mangoes. 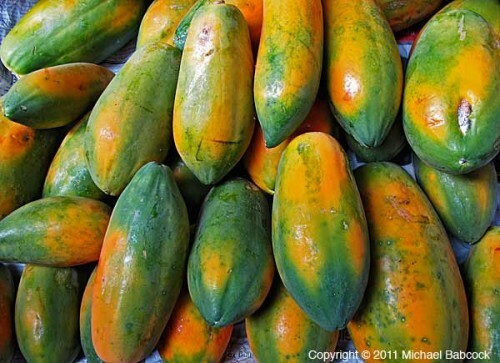 Here are orange and green papayas. Naturally, there are numerous vendors with fresh vegetables; these are artfully displayed indeed. 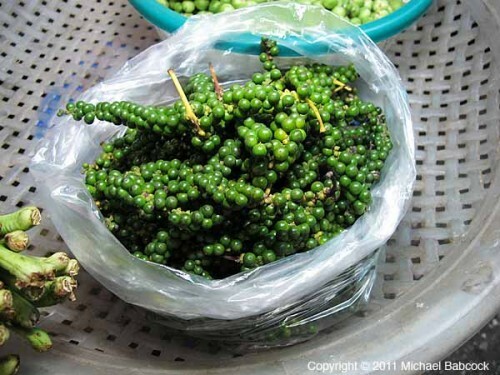 Thai markets in general have a wealth of exotic ingredients hard to find back in the U.S., such as these fresh, green peppercorns. The market also offers cooked ingredients that can be taken home and incorporated into a dish, such as these roast green eggplants. 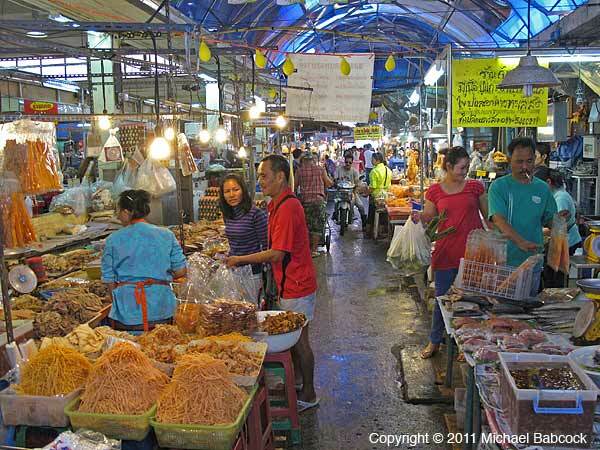 Hua Hin market offers any ingredient you need to cook Thai food. 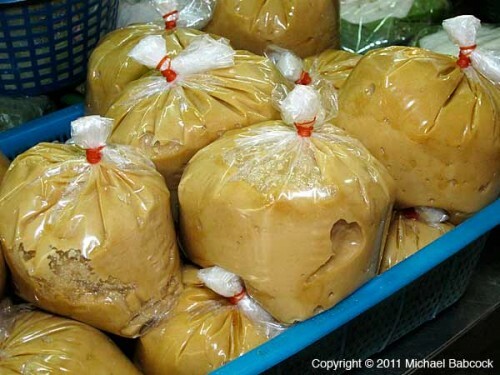 Here are plastic bags of soft, easy-to-use palm sugar. 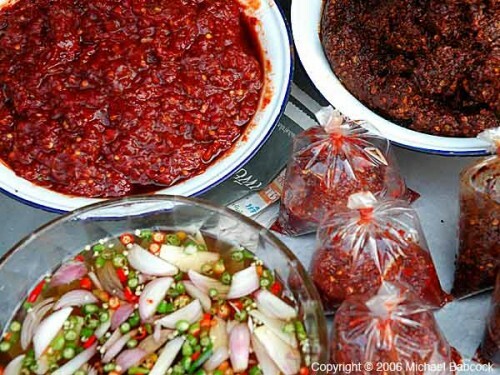 The market also offers fresh-made chilli pastes and sauces, providing an easy way to make an easy, delicious dish. Here are some more spicy sauces. Here's an inner aisle with several butchers offering fresh meat. 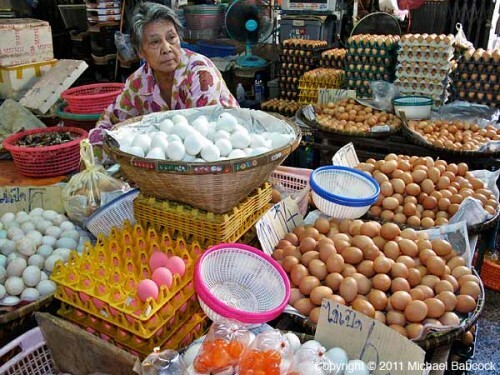 This woman offers chicken and duck eggs and also salted duck eggs. You select the eggs and take them home in a plastic bag. 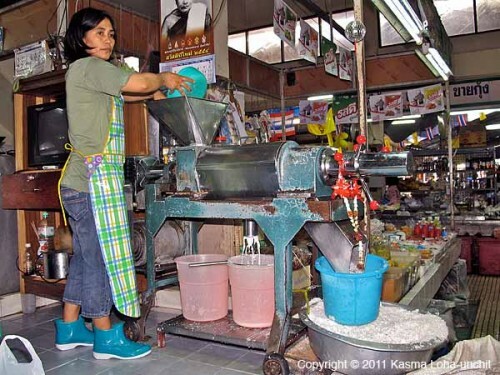 Here a woman is making extracting fresh coconut milk from the flesh of coconuts; notice it running into the front pink bucket. Of course, there's lots of pre-made food. 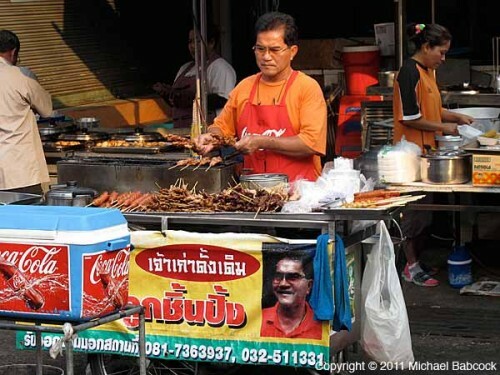 This vendor is out on the street and offers various meats on sticks, such as satay and sausages. 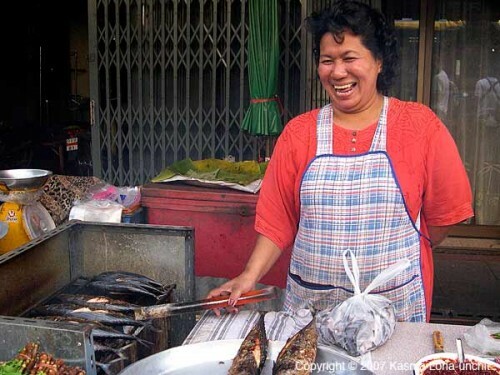 Here's a grilled fish vendor with a marvelous smile. 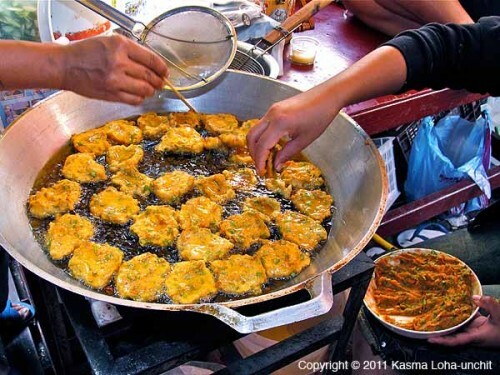 Here's a close-up of fish or shrimp cakes fried in oil in a wok. 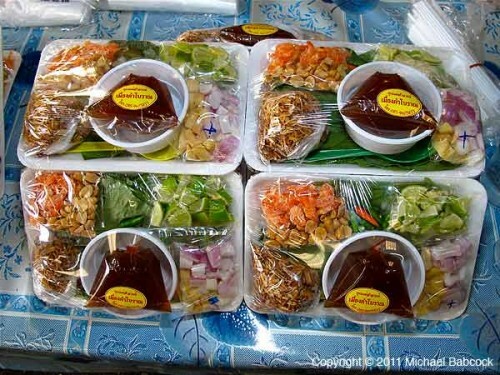 There's also many different pre-made foods, such as these packages of miang kam. 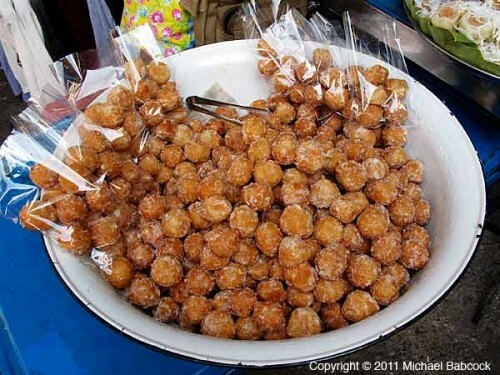 No market is complete without a complete selection of kanom (snacks), both Thai and, as we see here with these "donut holes," western. Every Thai market has at least one vendor with colorful flowers; here we also see refreshing young coconut, ready to drink. Here’s a variation on one of the most popular dishes in Thailand – Pad Ka-prao – meaning “stir-fried with (holy) basil.” Almost anything you can think of – pork, beef, chicken, fish, shrimp – can be stir-fried with basil and served over rice. One of my favorite variations of the dish, and a staple when Kasma is out of town because it’s so easy to cook, is Salmon Stir-fried with Basil. Pad Ka-prao is one dish that I’ve learned to cook very well. I remember the first time I ever cooked it. It was back in 1992 when I took the beginning cooking series from Kasma; she teaches Spicy Basil Chicken in the second class. As she demonstrated it all looked so very easy and natural. So I decided to cook it for myself at home. That very first time I found out that Kasma’s ease was a bit deceptive; when I cooked it, everything seemed to happen way to fast! Each time I made the dish it became easier and the process seemed to slow down. Practice can, indeed, make perfect. Learning to cook the dish well has been one of my lessons about the process of learning something new. When I first cooked the dish, my nose was in the recipe because I was so afraid of doing something wrong. As I became more comfortable with the steps, I’ve been able to internalize the recipe and learn how to adapt it to different things. 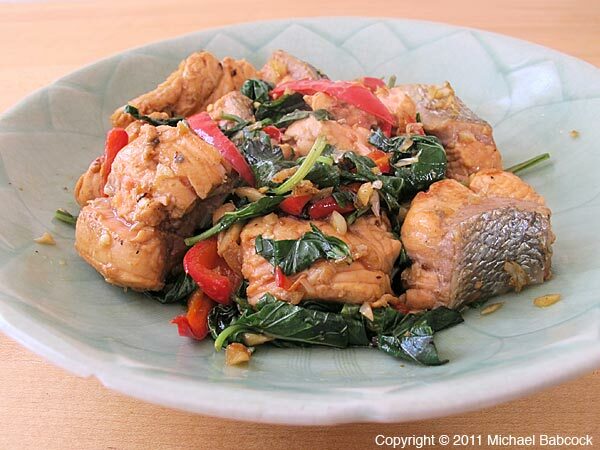 The basic recipe is Kasma’s Spicy Basil Chicken – Gkai Pad Gkaprow This recipe is a good starting point. For the dish pictured here, I made a few changes. 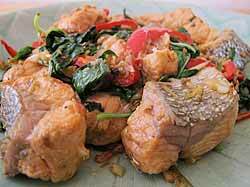 Because I use Thai sweet basil, rather than holy basil, it is actually pad horapa, stir-fried with Thai sweet basil. Heat the wok until smoking; add the fat, let melt; toss in the garlic; stir-fry for a bit; add in the chillies; stir-fry a bit longer; add the salmon; stir-fry for a bit; sprinkle in and mix the black soy sauce and fish sauce; add the basil and stir-fry until wilted. Serve over rice. The key to the recipe is not to overcook the salmon; make the pieces a bit larger than bite size and make sure it’s still slightly pink on the inside; you’ll want to work pretty fast, not stir too much (you don’t want the pieces to fall apart), and add the basil early enough so that it will wilt before the salmon overcooks. This is one dish where I prefer bai horapa – Thai sweet basil – to bai ka-prao – holy basil; I think it goes better with the salmon. As always, this is a dish you should make your own. None of the quantities are set in stone. 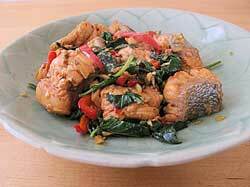 Try it with more garlic; or more chillies; or more basil; or less fish sauce. After you’ve cooked it once, try it again within a couple of days to see how the new variation tastes. [1.] You may notice that I have transliterated the Thai word for holy basil at ka-prao and Kasma has transliterated it as gkaprow. The most common transliteration that you’ll find on the web is actually kra-pao, which makes no sense at all because in the Thai spelling there is no “r” after the initial consonant. The Thai alphabet differs from the English alphabet. The initial consonant for gkaprow or ka-prao is gaw – gai (or gkaw – gkai), the sound “g” (or “gk”) as used in the word gai (or gkai), meaning chicken. The official Thai transliteration for this consonant, which is actually a cross between a “g” and a “k” is “k”; Kasma prefers to transliterate it as “gk” because this it conveys the sound more accurately. The second syllable can be transliterated either as “prao” (as is official) or “prow” as Kasma has done. The point is that any spelling of a Thai word that uses English characters rather than Thai characters is very likely not a very good representation of the actual word, particularly because the spelling with Thai characters also gives you the correct tone. You are currently browsing the Thai Food and Travel Blog blog archives for September, 2011.